This chapter summarized Schuyler’s birth, the family’s move to New Haven, CT, her father’s new job, and the challenges and joys of caring for a baby during the first year. During labor, Julie’s mother telephones and asks her what she would like to get her brother for Christmas. What? Julie instructs Robert to hang up. How bizarre; maybe her mother has some pragmatic issues?! Or maybe she was just really nervous. I found Robert’s description of the birth funny and it also brought back memories for me. To quote the author, “No one tells you how extremely… extreme the birth is going to be, and afterward, you don’t talk about it because you’ve got a clean, happy little baby to play with, and besides, who wants to remind the love of their life that such a thing happened? But it did, and man oh man. I’m just saying.” The author goes on to describe the ordeal they went through with Schuyler’s jaundice. the beginning of the chapter, the author states he feels guilt because, when Schuyler was an infant, he didn’t suspect anything was wrong. He goes on to say that he knows this guilt is unfounded, but that it still bothers him today. Disquiet (dis qui et) n. a feeling of anxiety or worry. Not knowing the reason behind your child’s developmental delays can cause a feeling of anxiety or worry. I work with a lot of students for whom there is no ‘official’ diagnosis, I’m sure many of you do also. The journey towards a diagnosis will frequently be long and confusing, with many wrong turns along the way. In this chapter, Robert wrestles with his first acknowledgement that the fact that his daughter is not yet talking isn’t normal. He experiences a roller coaster of emotions as each possible reason for the delay is ruled out. He contemplates life for his daughter, if the reason is hearing loss. When that is excluded, he is back to square one, with the reason being unknown. My take away from this chapter is to increase my empathy for my student’s parents during the diagnosis phase. Parents are often anxious before the ARC meetings, worrying about what they will learn regarding their precious babies and how that will impact their future. 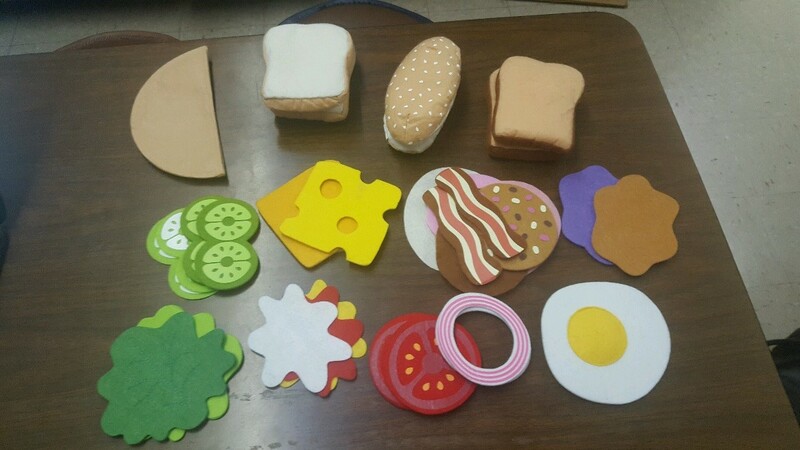 Today Erin Ruppelt, SLP at Kennedy Montessori and Central High, has a fun food activity to share! 3. Categories- vegetables, meats, sauces, etc. 4. Basic concepts- temporal (ex: first put ham on, then cheese), spatial (ex: put ham on top and cheese on bottom), quantity (more/less vegetables). If you don’t want to buy the product, you can also use paper food. (See attached ‘sequencing’ links for paper food) You can also buy a larger set here. From the writer’s perspective it seemed that he was reflecting on how nothing in his life was what society considers “the norm”. Nothing was typical about his life. He skated by in life with minimal drive to do well academically, his aspirations were to be a zookeeper as a child and only as an adult male did he want to be a fireman when everything in his life was falling apart and he wanted to wash his hands of it all by burning it up. He worked jobs that paid the bills, not that he enjoyed doing. He was married and divorced and then fell in love with his current wife of whom their relationship and love for each other seemed to be the first thing in his life that he worked hard to develop and grow (by talking on phone, writing love letters, and enduring a long distance relationship). They ended up marrying and he had to prepare himself for fatherhood of which he never imagined would come of his life especially because he only knew how “not” to be a father. He was prepared, however, to hopefully be a better father than his own as he knew his own child would change his mentality that he only knew how not to be a father. The obvious statements of thinking you are preparing for a baby but there really is not PREP for having a baby until they enter your lives provides some foreshadowing for how he and his wife could never prepare for how drastically their lives were about to change. The author seems to suggest that he is beginning to grow up and have some ambition in life as he is now married and expecting a child and that his life might be turning more into the societal norm of getting married, having children, etc. This ‘spider chart’ or ‘brainstorm web’ can be used to describe with an item (and can be used with the EET method). The “Frayer Model” is another popular method used to develop describing skills. 2 different models that can be used to compare and contrast are the venn diagram and this compare and contrast chart. I have also used hula hoops and post-it notes or pictures to explain the venn diagram. It seems to really help kiddos understand how it works. Do you use graphic organizers in therapy? Which ones do you find to be the most beneficial? Are there others that I have missed? As promised, this is the post that will discuss some ‘supplementary materials’ related to our book study. As you may or may not have realized already, Robert Rummel-Hudson began his literary journey by writing a blog, way back in 1995–before blogs were even a thing! You can take a look at some of his work here and here. You can find more information about the book here. I also wanted to share the link to “Welcome to Holland” by Emily Perl Kingsley. Rummel-Hudson refers to this piece in chapter 6. I’m sure many of you are familiar with this already, but I wanted to share the link, incase some of you are not. Do you have any thoughts about these quotes? Do you think they are fair/accurate/true?? Do you find any of these statements thought-provoking? Happy Friday! Is it me, or do short work weeks seems so much longer than regular weeks? Oh well, we made it! On Tuesday, we talked about releasing students and how to decide when it is time to release. Apparently, this is a topic that ASHA finds important as well. Many of the points in this article from reflect Tuesday’s discussion. The section labeled “Avoid an all-or-nothing approach” makes very similar points to a PD Melissa and I have presented a few times to different role groups and summarized in this post. A similar topic was covered by the middle/high PLC when they created this checklist. What are your thoughts on this? Do you have other tools that are helpful in deciding when it is time to release students? Do you find that most opposition comes from parents or from other professionals? How do you deal with opposition?